ipil-ipil, and other forest trees. Cereal crops like corn and plants such as banana, mango, coconut, coffee, cacao, citrus, peanut, mongo, tomato, and eggplant are favorites of honeybees. – must have an abundant number of pollen and nectar producing plants within 3 km.- 8 km. radius. 2. Buy bee colonies from existing beekeepers. 4. Construct a good quality beehive – a box that houses the bees and consists of frames, top cover, hive body, division board, and bottom board. 1. Feed the bees when there is scarcity of nectar and pollen. 2. Prepare for honey flow. Add empty frames with wax foundation sheets to existing frames in the colony when there is no space left for the queen to lay eggs. The number of frames to be added is determined by the laying capacity of the queen. A colony ready for honey flow must have nine to ten frames with bees to maximize availability of nectar. 3. Place the empty frames side by side with the emerging brood. 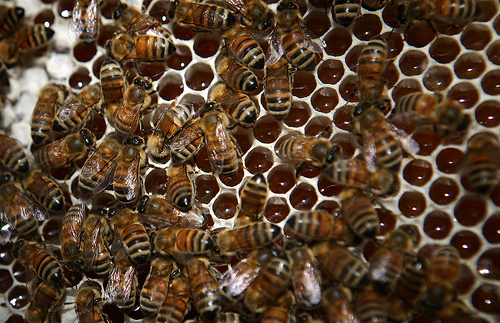 Do not treat the bee colonies with miticides one month prior to honey flow. The treatment of mites, foulbrood, and other pests and diseases must be done two months before honey flow. Undertake biological treatment with tobacco and alagaw in cases of mite infestation. 1. Open the hive. Blow smoke towards the bees to avoid stinging and swarming. 2. Select ripened honey frames or sealed honey frames from the colony. 3. Take, shake, and brush the filled frame off the bees. 4. Uncap the sealed honey with a sharp knife, fork, or uncapping spoon. 5. Put the uncapped honey frames in the centrifugal honey extractor. Extract the honey by rotating the handle of the extractor. Using a pail, collect the honey coming out of the faucet at the side of the extractor. 6. Strain using a sterilized mesh or moist cloth. 7. Sterilize the bottles by boiling for 30 minutes. 8. Transfer the honey in the sterilized bottles, seal with a plastic sealer, and label for marketing. Beekeeping helps improve ecological balance by promoting plant regeneration and species diversity through pollination. 1) Do not start a beekeeping project with incomplete beekeeping equipment and with less than two colonies. 2) Do not starve and overcrowd the colony as this will induce swarming. 1. Use a bee veil to avoid stings. 2. Do not stand in front of the hive. 3. Remove the cover gently and puff smoke towards the entrance of hive. 4. Remove frames and inspect both sides. Examine the rest of the frames and return to their original position. 5. Do not feed the colony when it is raining. Bees are aggressive during this time. 6. Do not use lotion or perfume during inspection. This might induce the bees to sting. 7. Do not spill sugar syrup in the apiary. This will induce robbing. Sources: DENR 1997, “Sustainable Livelihood Options for the Philippines, Upland Ecosystem: An Information Kit”. Hello Rosaline, I am establishing myself just outside Maasin, So Leyte. I am a beekeeper from the UK. Moved here in November and building a new house just now. All my equipment is still in the UK But will be sending it all here soon as my SRRV is processed. (slow). saan po tayo pwedi mag seminar? start earning dollars now, http://InternetDuty.com/?id=Chloe.